One of the biggest mysteries of all the times has been the Mystery of Bermuda Triangle. Anything that flies over this natural vacuum or tries to go near it loses itself to the disastrous Devil Triangle. Many scientific theories have tried to find the reasons behind the suspicious happenings near Bermuda Triangle but have never found the justified reasons. 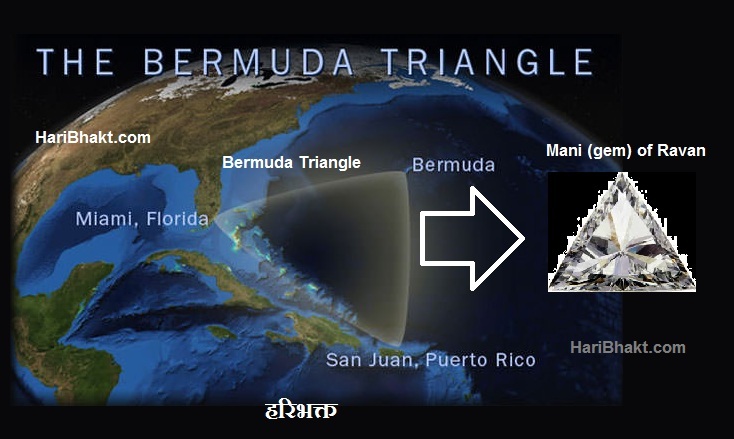 Science might not have been successful in uncovering the secrets of this triangle but it seems as if Hindu history have something stored in their treasure box. There is an interesting story in Sundara Kanda, the fifth book in Ramayana where Lord Hanuman encounters the energy above the sky of the ocean similar to the energy of mysterious Bermuda Triangle. Sundara Kanda depicts the adventures of Lord Hanuman. Demoness Simhika meditated for thousand years so that Lord Brahma could bestow her some desired powers. Contented Lord Brahma asked her about what powers she wanted. To this, she demanded a boon of attracting anything irrespective of its powers towards herself. She was also known as Chhayagrahi as she was capable of grasping objects or beings merely with their shadows. She was strong enough to swallow anything she wished to. Once, Lord Hanuman in search of Mata Sita was flying over the Ocean, he realized that his speed was lowered and he felt all powerless due to some invisible force. After a few moments of analyzing he saw demoness Simhika trying to pull him towards her through his shadow. A battle was now ensured. Using his brains, Lord Hanuman decreased his size, entered the demoness’ body and destroyed all her internal organs. It is believed that she fled to some mysterious place. That place where she is hiding might be the Bermuda Triangle. Clearly familiar lines between Chhayagrahi’s boon and capability of Bermuda Triangle to grab things could be drawn. We all know that the demon king Ravana had a gem in his navel which had a boon of immortality. Lord Rama killed Ravana by shooting his navel with an arrow. This attack by Lord Rama destroyed the nectar within the gem which became the cause of his death. After his death the gem became imperative. It was necessary to place the gem at a place which would soak its endless power. Lord Hanuman was given the duty to find this place. He took the gem to the deepest core of the ocean so that its impact if not ended could be minimized. That deepest core in today’s times could be the place where Bermuda Triangle is located today. Many different energies from the bygone Vedic ages are still present in the world, and an example is The Bermuda Triangle.